This is a wonderful first book by a talented author. His character, The Wanderer, is a habitual drunkard at the beginning of the book and has no memory of his previous life. We accompany him on a journey to find out who and what he is. This Gothic tale includes cursed villages, a haunted abbey, a grim castle and a femme fatale with a blood fetish. It's not just gore to the knees, though, but a thoughtful look at deeper issues - life and death, Godhead and mortality. Wonderful stuff.Cornelius Harker is a master story teller but I feel his greatest strength is his knowledge and use of the English language. He can cast a spell with words and light up a dark Gothic chamber with a phrase that will make you hold your breath at its beauty. When the imperative of the story draws you back, the darkness is deeper and the horror more profound because the light of that arresting phrase has gone out.It's the first in a planned long saga so we are given little hints to hold on to. Cornelius is subtle. I look forward to more - writing of this quality is rare and precious. This is a beautifully written book, the words and phrasing are so eloquent that I savoured every word.I love fantasy but wasn't prepared for the dark horror that both captured and terrified me in equal measure. I can't wait to start the second in the series 'Words to the Wise Towards Darker Climes' which I have downloaded straight away onto my kindle. When I first began this book, I honestly didn't think I would finish it. For a start, it is huge. Or so it seemed. Difficult to tell on Kindle. And although staying true to the Gothic genre in both language and setting, there were moments early on that seemed so close to the narrative of Shelley's Frankenstein - one of my all time favourites - I almost gave up.But as I read on, there was a tipping point.Whether it was the incredibly beautiful language, the author's ability to draw me into a world so real, yet unreal at the same time, or the plain good old fashioned mystery of the story, I'm not sure. But drawn in I was, and I realised Cornelius Harker was not just adhering to the Gothic literature form so well established, he was going beyond it, taking it to places Mary Shelley may well have gone herself if she had the ability to still be breathing today.In short, I have rarely read an author with such a command of the English language. Ever. I would read a shopping list written by this man.But, is the author's ability to write raptures enough? There has to be a story too, let us not forget that.One criticism that could be levelled at the book, and it would be remiss of me not to mention it, is that I felt after finishing the book, it was as if the character had moved but a couple of inches from where he stood at the start. 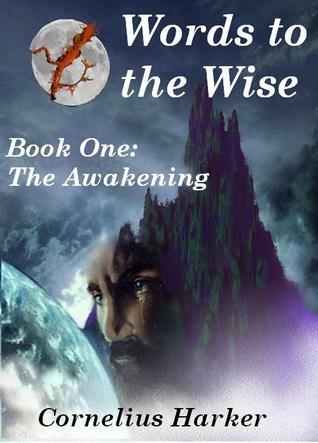 The journey was incredibly enjoyable, and the experience for me as a reader, mesmerising, but I'd have to say there was not much in the terms of character development or movement of plot.As this is obviously part one of a very lengthy story, however, I am more than willing to concede the author this point. I think some work could be done with the title, also. The text is so brilliant, the book deserves a less mundane title. Just my opinion.In summary, the story contained more than enough mystery and enjoyment to make the reading of this book one of the most enjoyable reading experiences I have ever had.And that is saying something.So much so, I downloaded part two of this series immediately.Extremely highly recommended for anyone who loves gothic literature or dark fantasy. I read this book as part of the UK kindle book club. The review it received was so good that it was my first choice and I am glad it was. It is way beyond the style of book that I would normally read and as such took me a while to get into the 'feel' of the book. Initially the writing style appeared to hide a limited plot, but it became clear that the auther was just gently initiating you into a bizarre world.The language used was beautiful in places although I did feel at times there were sentences of beautiful words which conveyed little.The plot itself was quite dark, so if you like that style you will love this book. I'm not sure that I could summarise it adequately so I will leave that to others. There was a lot of attention to detail throughout the book and the one essential I look for in a great book was missing: however it was a necesary emmision. I love to get a feel for the characters and that was missing with the main character of this book. This was due to the fact that the character himself was searching for his own sense of self, so the fact that I was on that search with him shows how well written the book is. Hopefully the next books will uncover this. Overall I found the book disturbing and yet enjoyable. The annoying thing about this book is that not only has it ended but I don't yet have the second! I can't even begin to describe this book in the way it deserves, it follows one man known as "The Wanderer" as he sets out on a journey of discovery to find himself and how he came to be where he was at the start of the book. He has no memory of anything and does not even know his own name. It is full of tradgedy, the supernatural and the gruesome but yet it feels so real. (I will add at this point that this is definitely not a book for those with a weak constitution!). The wording that the author uses really helps to paint the scene and express the emotions of "The Wanderer" in relation to what is happening. I love the way the books is told by "The Wanderer" to another individual for me it gives the book a different edge than if we had been going through the story with him as it was happening. I loved everything about this book, although if you read this be prepared to be reading at least one more book, it is not a stand alone book unless you don't mind the story being unresolved. This book was chosen for our Goodreads group and I am so glad it was. I already had the sample on my Kindle, and I know I would have definitely eventually got around to reading it and subsequently downloading the full book, because I was hooked from the first few pages of the sample. It's not often a book comes along that you feel a connection with. You can like a book, you can love a book. But sometimes you can feel more than that, a passion almost and that's exactly how I felt about this book. I am not sure what genre this book falls under, sometimes though the writing is to such a high standard, like this one, that the genre hardly matters. It wasn't just the writing style though, I really did love the story too. It pulled me in so quickly and I found right from the beginning that I really did want to know what happened to The Wanderer. I know the book won't be to everyone's taste. For me personally though it felt like one of those books that deserves to be a modern classic. I am afraid my impatience won't allow me to delay reading book 2 and I have already bought it. It is very sombre, dark and I would even say oppressive. The words, which are beautifully composed are in danger of dragging the reader down into those murky depths the writer has created. So if you are looking for some light hearted reading you shall not find it between these pages. I think the epic fantasy and horror readers will enjoy it. I am trying to think what comes close in comparison, perhaps the darkness of Poe and the depression of Kafka mixed with a huge slab of fantasy genre, with an odd fanged villian or two to go with it. I wonder, if this creation has been brought forth from the tortured soul and the inner demons of this writer, then what could he achieve if he let the sun shine through with the same intensity.An interesting read. This is not usually a book I would pick and is a genre that I am not particularly familiar with but was recommended it by a few people. I am so glad they did. Although this has taken me a little longer to read than others I have read recently this is not due to me not enjoying it but wanting to savour it!The writing is stunning and the story intriguing. I have the next in the series already and cannot wait to get started on it. I need to know where The Wanderer ends up next! Having finished the book I'm still not sure whether I really enjoyed it. I found it somewhat strange in places, and couldn't empathise with the main character. Having said that, I will almost certainly read the second volume as I am interested in what happens going forward. Guess it was more interesting that I thought whilst reading it. This is definitely not my type of book. It is quite horrid. And yet I could not put it down, and I will read the sequels. It is beautifully written and reminds me very much of the style used a hundred years ago by writers I am now re-reading after more than sixty years. Rider Haggard, for instance - not that Sir Henry would have included the depravities conjured up by Cornelius Harker. This was not really my type of book. It is well written and the wording, beautiful but I suppose it is the Gothic genre that is not to my taste but that is what a book club is all about. This will not stop me buying book two to see what happens though. Well I have just finished this and was wondering where it was going? ?But even though I thought that it was kinda depressing - I really enjoyed it - Weird me much - NO!!! LOLVery lyrical and great prose and world building... Will get to the next one soon,.. I abandoned this book at around 37% because I really wasn't enjoying it. I'm sure it is very well written, but was just too dark for me. Cornelius Harker Mark Lane - Writing primarily within the fantasy/horror genre, Cornelius Harker explores the darker side of storytelling. Sometimes utilising a more baroque form of narrative in contrast to the modern day approach, Harker writes for readers who enjoy grandiose story arcs and who also possess a penchant for feeling unconditionally scared.